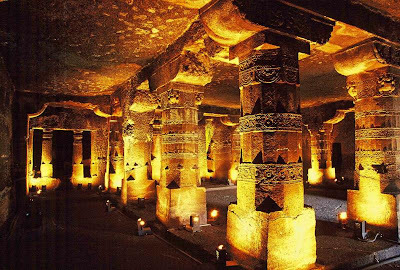 The Ajanta Caves are 100 kms. away from Aurangabad are one of the must see places in India. The 29 caves not only contain remarkable sculptures but also very well preserved wall paintings. The caves are cut in a shallow horizontal strata of hard trap. Nearly 600 yards long the Caves are thirty to a hundred feet above the stream. Of the twenty-nine caves, five are Chaityas and the rest are Viharas. The caves belong to the Buddhist faith right from the earliest Caves of the second and first Century BC. In the older "Chaityas", the Chaitya caves are about twice as long as they are wide or high and have almost always a rounded inner end. Their roofs are vaulted and two of them have wooden ribs, and in the others, the stone has been cut in imitation of the wooden ribs. The columns are plain eight sided pillars without capital or base. The later "Chaityas" have ornamented base and capitals as well as curved pillars. Within the semicircle end of the caves, we have a stupa. The Caves front is formed by a wall three doors or one door and two windows. The Viharas are usually square with low flat roofs and cell at the sides and ends. The resupported with a row of pillars. All these caves have front verandahs with cells at ends or a verandah with cells opening from the back of it. Lodi Garden: This garden is in its full glory from January to March and can be approached from Lodi road and Max Muller Mag. Mughal Garden in Rashtrapati Bhavan is open to public in February and March only. Rose Garden: This beautiful garden full of roses is situated at Shanti Path. Buddha Jayanthi Park: It was established to commemorate the 2500th anniversary of Lord Buddha. The approach to this park is from Ridge road, Sardar Patel road and Shankar Road. Ajmal Khan Park: Spread over five acres, it is popular for its musical fountain. Talkatora Garden: Situated at Willingdon Crescent, it derives its name from the tank situated in it. 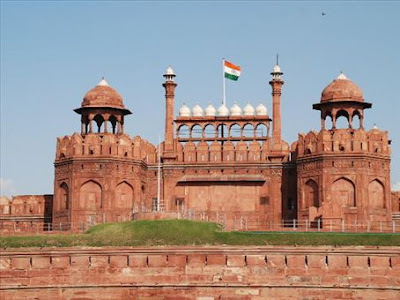 RED FORT is the most magnificent of all Indian royal palaces. It is a red sandstone building with mighty walls surmounted by fine towers. The fort was built by Mughal Emperor Shahjehan at the right bank of river Yamuna on the eastern side of the city and near Chandni Chowk. Shahjehan, after reigning at Agra for 11years decided to transfer his capital again to Delhi owing to the lack of space, excessive heat and unlevelled ground there. The foundation stone of the fort was laid in 1639. It was completed after 9years and 3 months at an estimated cost of Rs.9 crores of rupees. The design of the Fort was prepared by famous architect of his time, Ustad Ahmad Lahori, while the Chief Superintendent of the work under whose supervision the Fort and its buildings were completed, was another renowned architect Mukarramat Kahn. Don't miss to visit Red Fort. Tomb of Imam Zamin: The Tomb is situated to the east of Alai Gate. Through this gate one is to reach the Tomb. 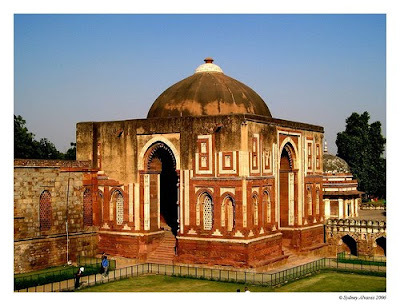 It was built in the timeof Mughal Emperor Humayun. Imam Zamin was a member of Chishtia sect. He was a Sayyid and descendant of Imam Hassan and Hussain. He came to Delhi from Turkistan in the reign of Sikandar Lodi. He was appointed as Imam, the highest official in the Quwwat-ul Islam Mosque. The plan of the structure is a square one having a base of 24 feet. There is a dome surmounted over it. The whole structure is built of sandstone which is covered with finely polished stucco. A double row of kanguras also exist on the building. The name of the saint is inscribed on the building. If you find time visit this place in Delhi. This is a beautiful Tomb. Quwwat-ul Islam Mosque: It is the earliest mosque extant in India. 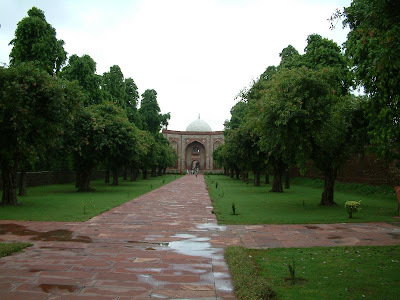 It is situated just close to the Qutub Minar. The mosque was called by the nae "Quwwat-ul Islam" which means "Might of Islam." It was founded by Qutubuddin Aibak after wresting Delhi from the Chauhan King. Alai Darwaza: At a distance of a few feet south-east from the Qutub Minar, there stands a big gate called Alai Darwaza. 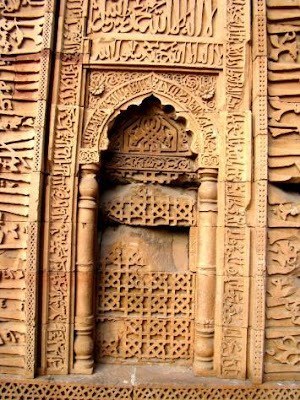 It was built of red sandstone, richy ornamented with design in relief by Alauddin Khilji in 1310. It is the most magnificent gate in the World. The planning of the gateway is in square measuring 35.6 feet internally and 55.6 feet externally. The height of the walls is 47 feet from the floor to the ceiling having a thickness of 11 feet. Are you planning to visit Delhi. There are many places in Delhi to visit. We will discuss one by one in the posts. First we will see Qutub Minar. 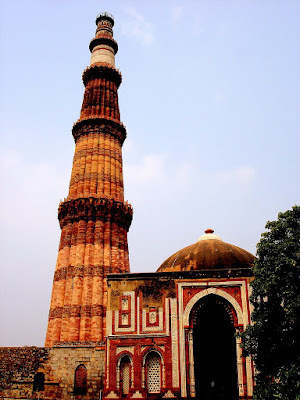 Qutub Minar is the highest tower in India, the turret of which once acting a a sentinel watching the movement of the ranks of aggressors and now keeping an eye upon the activities of the inhabitants of Delhi and its suburbs. Although the Minar has been damaged by lightening and earthquakes, yet its magnificence has been fascinating the minds of the people coming from far and wide. There are reasons to believe that the Qutub Minar was once called Prithvi Sthambh as it was initially the creation of Samrat Prithvi Raj Chauhan, the last Hindu ruler of India. Qutubuddin Aibak refashioned it and rebuilt it in Muslim style in 1200 A.D. Qutubudin Aibak was the slave,army commander and the viceroy of Muhammad Ghori, King of Afghanistan. To celebrate the decisive victory over the Rajput forces the Chauhan King in 1192 A.D. in the field of Tarain, by Muhammad Ghori, Qutubuddin Aibak commenced the minar. If you visit Qutub Minar try to see the hidden pathways, that are used by Kings during emergencies. In Qutub Minar don't tamper the walls, you should maintain cleanliness inside the campus. 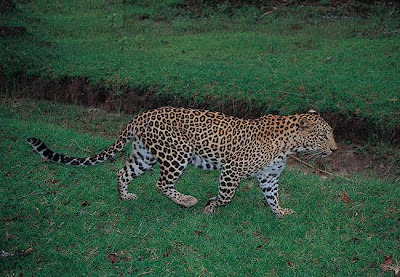 In Karnataka, the Bandipur National Park is one of best Tourist Spot. According to 1997 Census, more than three thousand elephants and seventy tigers home is Bandipur National Park. You can also watch sloth bears, leopards here. Recommended by UNESCO, Bandipur National park is under consideration for World Heritage Site. This Park is famous for rare species and Sandalwood trees. You can see the rare animals like white tiger here. The best time to visit this National Park is April to October. Bangalore is the nearest Airpot. Bandipur is approx. 200 km. from Bangalore. The nearest railway station is Mysore which is 80 km from here. You will enjoy the trip and it is going to be a memorable one for you. HOTEL IN AGRA. There are many Hotels in Agra. From Budget hotels to Luxury Hotels. You can comfortably stay in these Hotels and enjoy your holidays. Planning to Visit Tajmahal one of the seven wonders of the World. After visiting Taj Mahal you can visit many places in Agra. The important one is Agra Fort and the next one is Sikandra Fort. In 1565 A.D. the greatest Mughal Emperor Akbar built the Agra Fort. This is one of the Fort which is a masterpiece of construction. The other names for this Fort is Lal Qila, Red Fort and Fort Rough. This is very near to Taj Mahal. 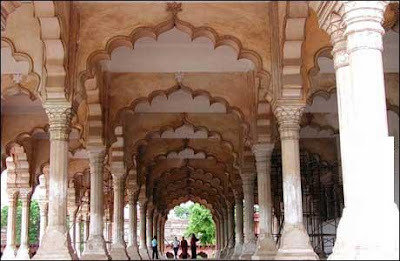 The superb buildings the Moti Masjid, Diwane-E-Am, Musanman Burj and Diwani-E-Khass are within the Agra Fort. These are all the must see places in Agra. India’s greatest Mughal Emperor Akbar built the Sikandra Fort. This project was continued by his Son Emperor Jehangir and completed as Sikandra Fort complex. Sikandra Fort. The beautiful red stone tomb is square shape is the unique one. 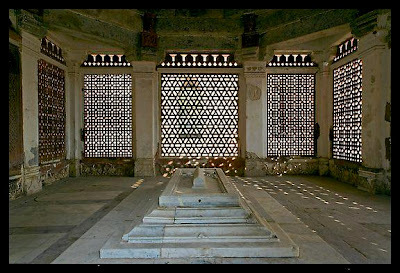 The marble work and pattern work in the tomb is a beautiful work done in those days. The garden here has fountains also a beautiful sight for the visitors. Udupi Sri Krishnar Temple attracts thousands of devotes from all over the world. From Mangalore Udupi is sistuated 60 kms away. If you are visiting Karnataka the important places are Bangalore, Mangalore and Udupi. Great Sanskrit Philosper, Madhavacharya established this Udupi Sri Krishna Temple in 13th Century. Everyday thousands of devotees were served meals in the form of Prasada in this temple. This is a great experience. It is believed that Great composer Kanakadasa seen the Lord in this temple. The devotees take a holy dip in the Madhava Sarovar holy tank here. Udupi’s Car Street is famous for shopping. Here you can find supermarkets, malls and branded shops. You can purchase traditional Kundan jewelry here. All over India Udupi restaurants are famous for its idlis, dosas, etc. You can taste the traditional south Indian dishes here. The water falls in Kerala is the best place to enjoy. The waterfalls here are Athirappally, Vazhachal, Attukal, Cheeyappara, Thommankuth, Palaruvi, etc. At the entrance of Sholayar range the serene waterfall Athirappally is a beautiful sight you can see here. Athirappally is a famous shooting spot. Many Directors choose this place i.e. such a beautiful place. Many buses are running from Chalakudy to Athirappally. This is wonderful waterfall located near Munnar. This is suitable for trekkers. 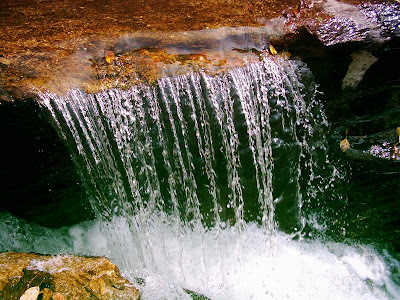 This is a beauty of nature and you can watch the many waterfalls and rolling hills here. This place is 75 km. from Cochin. You can stay here in the Hotels at Thodupuzha. From Thodupuzha this waterfall is around 15 kms. This is a superb place for nature lovers. 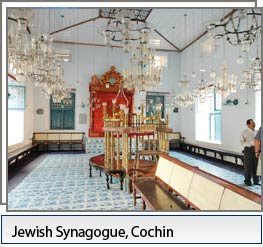 Cochin is another Tourist place in Kerala. The other name for Cochin is Kochi. Here you can spend your evening in the superb beaches and clam backwaters are marvelous. Some important places to visit are: Fort Kochi, Chinese Fishing Nets, Mattancherry Palace, St.Francis Church, Bolghatty Palace, etc. There are many architectures are constructed in and around the Fort Kochi by Dutch and British. This is the first fort built by Europeans in India. In the year 1557, Portuguese built the Palace and presented it to Raja Veera Varma of Cochin. In 1663, Dutch renovated the palace. Here you can see the scenes of Mahabharata and Ramayana and furniture of old period. Chinese Fishing Nets were brought from the court of Kublai Khan by the Indian traders. This is the best place to visit. Cochin is well connected by Air. It has an International Airport. You can go to Cochin by Train. 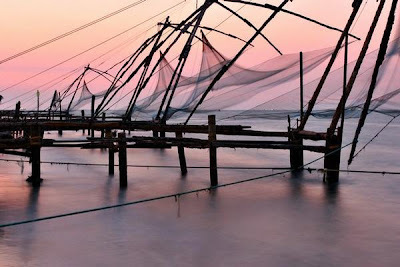 As an important place of Kerala Cochin is well connected by road to all major cities in India. Every year thousands of pilgrims visiting Guruvayur from all over India. Guruvayur is famous for Shri Krishna Temple. 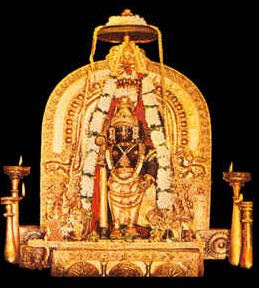 Here the God’s name is Guruvayurappan. To get the blessings of Lord Krishna, a large number of brides and bridegrooms and newly wedded couple visits here. The temple opened between 3.00 and 12.30 in the F.N. and in the A.N. 5.00 and 9.00 hours. Only Hindu members are allowed here. 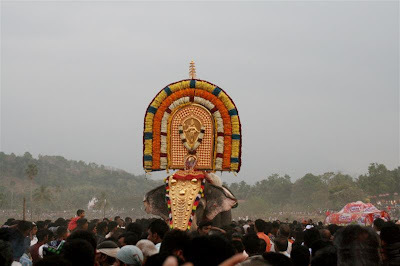 You can watch the grandeur and charm of 44 elephants in the Punnathur Kotta. If you want to visit this sacred place you can go by air/rail/bus. The nearest Air pot is Cochin. The nearest Railway Station is Trichur. Many buses are going to Guruvayur – Kerala Transport Corporation is operating many buses from major places in Kerala. You can stay here in the luxurious hotels or Budget hotels. All are available. Best time to visit Guruvayur is between October and March.